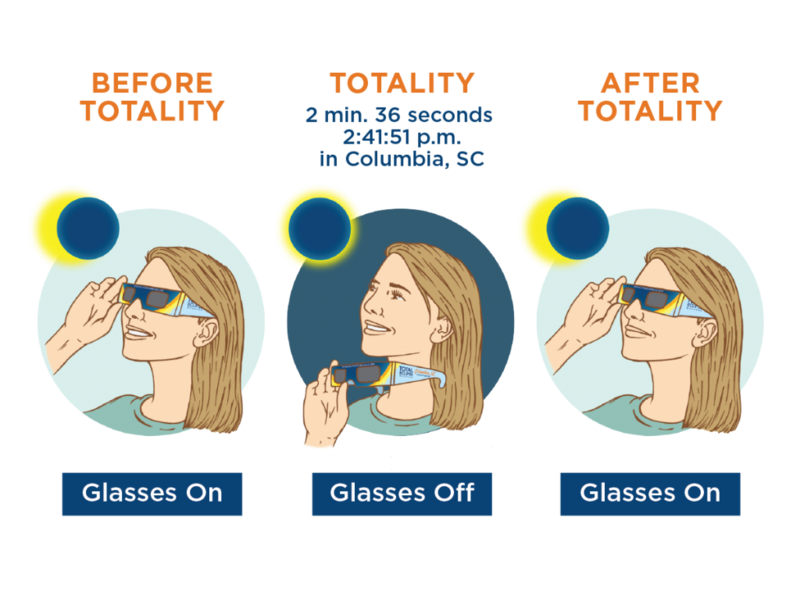 Protect your eyes during the “before and after” partial eclipse phases, but remove your glasses for totality. You can create your own pinhole projector! Most people do not look directly at the sun in their daily lives; an eclipse day is no different, unless you actively look up at the sun and gaze at it–which we all plan to do with gusto! You do not need eclipse glasses to go about your normal daily routine, however, and by all means, do not drive while wearing the glasses! In fact, don’t do anything but look at the sun while wearing eclipse glasses. Trust. Remember: remove your eclipse glasses when the sky goes dark during totality, and put them back on to look straight at the sun when daylight returns! Thinking about photographing the eclipse? Experts advise that we all put down our phones and cameras and enjoy the moment, and let the professional photographers capture the images for us all to savor later. Most people don’t have the right equipment to capture more than a tiny, bright dot. Still curious? Read up on some advice the AAS’ eclipse photography page. Viewers should consider the same sun safety measures one would employ when spending time outdoors in the summer, such as hats, sunscreen, insect repellent and hydrating beverages. Read the rest of this report by Kierstan Boyd, director of patient education at the AAO, here. Note: The partial eclipse before and after totality is not visible without glasses, since the sun is still so bright even up to the final moments of the moon covering the sun. It is of crucial importance that anyone planning to watch the partial eclipse leading up to and after totality protect their eyes with certified eclipse viewing glasses or safety film. To address concerns regarding fake or counterfeit eclipse safety glasses, the American Astronomical Society has just issued new guidance advising people to no longer look for language indicating that glasses meet certain safety standards (ISO standards, etc.). There are glasses on the market that have language printed on them indicating that they meet these standards, but many of these glasses have not been tested appropriately. The American Astronomical Society is now advising people to make sure their eclipse glasses are from reputable manufacturers instead of looking for safety/certification language. You may also be asked if glasses are “NASA approved.” NASA and AAS work closely together. 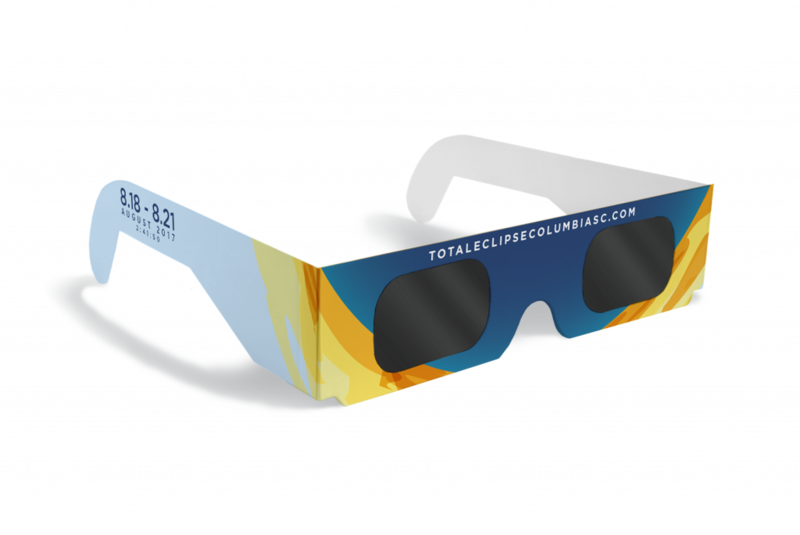 Note: the free eclipse glasses sponsored by the City of Columbia, S.C., for distribution to guests of most events listed on this site are from Rainbow Symphony, one of the NASA- and AAS-endorsed manufacturers.